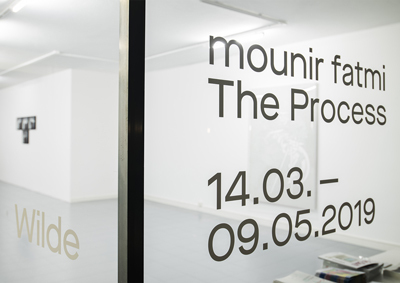 The exhibition "The Process" can be seen as a book that we can start reading in the middle. It is a series of thoughts, phenomena, an elaborate sequence of operations to reach an outcome that is ultimately the extension of the artist as a Medium. Influenced by the idea of the death of the media and by the collapse of industrial and consumerist civilization, mounir fatmi developed a reflection on the status of the work of art which is between Archive and Archaeology. Through his approach, he also develops a thought on the history of technologies and their influences in popular culture. Since the beginning of his artistic research, he has been interested in the subject of the Medium by using materials such as old typewriters, antenna cables, photocopiers or VHS cassettes. In this way, he questions the limits of memory, language and communication, while reflecting on materials that are becoming obsolete and have uncertain futures. 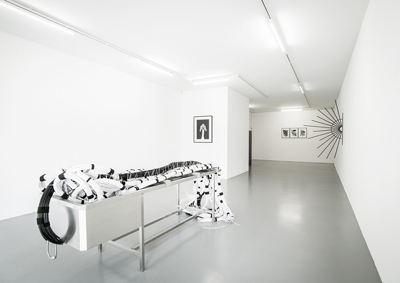 mounir fatmi’s work develops according to a rhizomatic value system, functioning as a network of connections in perpetual mutation. His installations often generate areas of turbulence and create semantic interpretations by linking the realm of thought to the act of creation. They raise the question of the Medium as an intermediary through which information is transmitted, but also as a border or a conflict zone between two spaces. With his critical perspective on the realities and illusions of our contemporary world, he states that the only way to approach and read his work is in the context of complexity and confusion. The French philosopher Gilles Deleuze thinks that we are not starting anything, that we are always in the middle between a starting point and an end. It is from this reflection that mounir fatmi conceived the exhibition "The Process" with a series of organic drawings "Everything is Connected" recalling roots and neurons composing an infinite network. The sculpture "Defense" is a metallic barrier raised by sharp peaks rising in the middle of the space as a separation forcing the spectator to go around it in order to take its full measure. The photographic series of black and white selfportraits "Peripheral Vision" addresses the theme of vision as a set of cognitive processes and mental operations that enter into the perception of our environment. 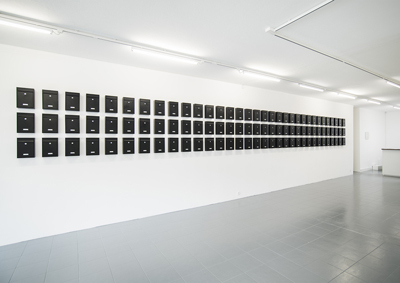 As well as installations such as "The Black Box", which includes 99 black letterboxes with the inscriptions of God’s 99 names. 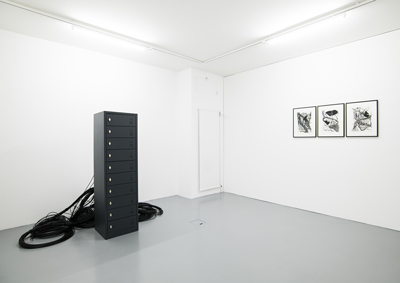 "Dead Memory" consists of a metal cabinet containing more than 2500 meters of black antenna cable, carrying no message or information. 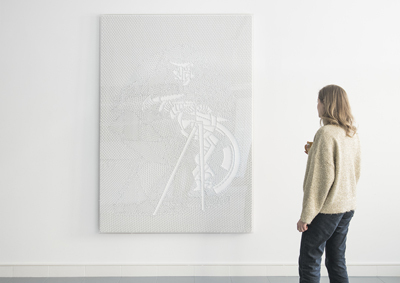 Finally "Autopsia" is composed of an aluminium autopsy table on which lies a sculpture of antenna cables as a body waiting for the spectator to consult it closely in order to see for himself what it contains. In an exhibition that metaphorically speaks of moving forward, the artist stops and asks the question of the "middle", as a fundamental concept in his artistic creation. 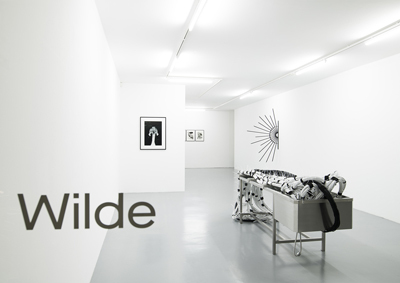 He invites us to consult works that are both complex and full of ambiguities. But to make it simple, as mounir fatmi would say, you have to be complex. Since 2000, mounir fatmi's installations have been selected for several biennials, the 52nd and 57th Venice Biennale, the 8th Sharjah Biennale, the 5th and 7th Dakar Biennale, the 2nd Seville Biennale, the 5th Gwangju Biennale, the 10th Lyon Biennale, the 5th Auckland Triennial, the 10th and 11th Bamako Biennale, the 7th Shenzhen Architecture Biennale at the Setouchi Triennial and the Echigo -Tsumari Triennial in Japan. 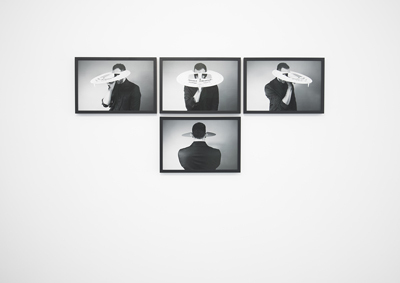 His work has been presented in numerous solo exhibitions at the Migros Museum für Gegenwarskunst, Zurich. Mamco, Geneva. Picasso Museum, War and Peace, Vallauris. AK Bank Foundation, Istanbul. Museum Kunst Palast, Düsseldorf. Göteborgs Konsthall, Göteborg. 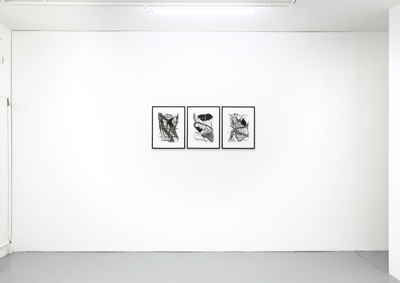 He has participated in several group exhibitions at the Centre Georges Pompidou, Paris. Brooklyn Museum, New York. Palais de Tokyo, Paris. MAXXI, Rome. Mori Art Museum, Tokyo. MMOMA, Moscow. Mathaf, Doha. Hayward Gallery and Victoria & Albert Museum, London. Van Abbemuseum, Eindhoven and at the Nasher Museum of Art, Durham. He has received several awards including the Uriöt prize, Amsterdam, the Grand Prix Léopold Sédar Senghor from the 7th Dakar Biennale in 2006 and the Cairo Biennale prize in 2010.